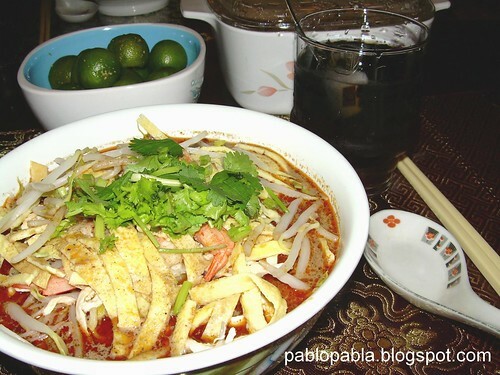 Any visit to Sarawak, Malaysia especially to the major cities and towns like Kuching, Bintulu, Sibu and Miri would not be complete without a sampling or indulging in the very delicious Sarawak Laksa. Many locals swear by their favourite stalls and some stalls are really famous. You will have to be there early to catch a bowl. I cooked Sarawak Laksa last Saturday. Invited some friends over and had a good time. Some say it tastes good but I felt that it lacked something. 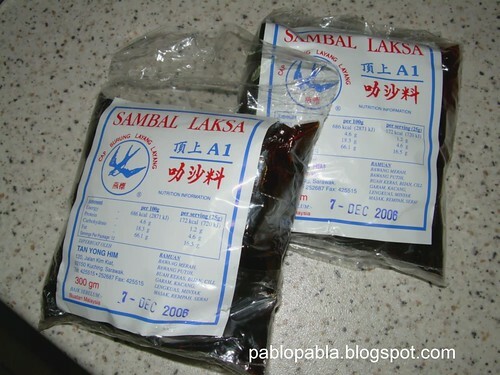 Could it be the laksa paste was not spicy enough? Of could it be due to my removal of some of the oil from the soup for health reasons? If you have cooked it before, I would appreciate your comments. 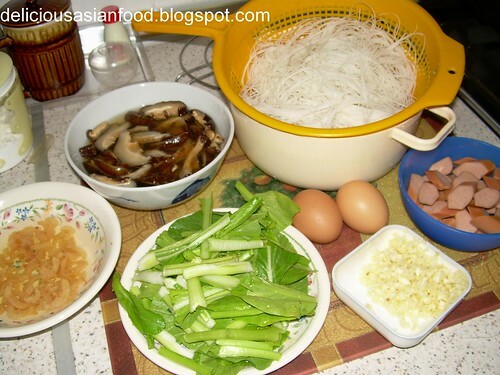 This is the Recipe for Sarawak Laksa which I cooked. Good enough for 16 bowls. Beat eggs and fry them thinly on a frying pan. Cut into strips. Set aside. Boil 4 litres of water in a stock pot. Upon boiling, add 2 teaspoons of salt followed by prawns. Boil the prawns till they start to float indicating that they are cooked. Remove the prawns and let it cool. Separately, boil 4 litres of water in another stock pot. Upon boiling, add 2 teaspooons of salt followed by the chicken. Boil till chicken is thoroughly cooked. Remove chicken and let it cool. Remove head and shell from prawn. Put back the head and shell into the first pot, cover lid and continue boiling for at least 2 hours on medium heat. Place prawn aside. Remove chicken meat from bones and shred the meat using fingers. Put back the chicken bones into the second pot, cover lid and continue boiling for at least 2 hours on medium heat. Place shredded chicken meat aside. Once both stock are cooked, remove heads and shells of prawns as well as chicken bones. Combine the stock into one pot. Add Sarawak Laksa paste and let it boil at medium to high heat for at least 30 minutes. Using freshly boiled water, blanch the beansprouts in 3 batches for 1 minute each. Drain beansprouts and set aside. 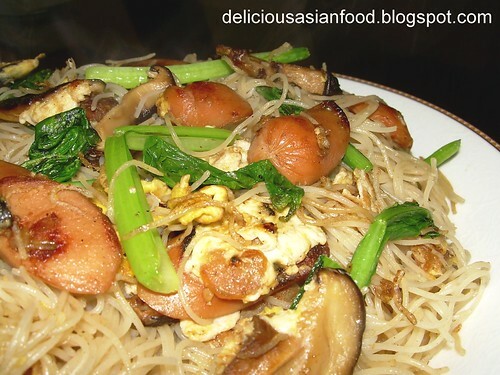 Next, cook the pre-soaked beehoon in 4 to 5 batches by blanching them in boiling water for at least 1 minute. Drain and set aside. After the Sarawak Laksa paste has been left boiling for at least 30 minutes, turn off heat and sieve and remove the spice from the stock. Bring the stock (now laksa soup) to boil again. Turn off heat and add coconut milk gradually whilst stirring. Add salt and sugar to taste. To serve, first place cooked beehoon on a bowl. 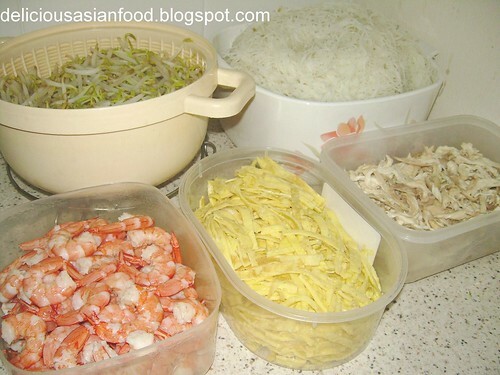 Add beansprouts, shredded chicken, prawns and egg strips. Then pour the laksa soup over the ingredients. Garnish with coriander leaves and squeeze a lime over the soup before eating. It is not recommended that the laksa be kept overnight as coconut milk is used. I had Roti Canai for breakfast this morning. I have it quite often…averaging at least once a fortnight. It’s a simple breakfast and cheap. You can get a piece for RM0.80 here in Kuala Lumpur, Malaysia. Roti Canai is essentially a type of bread wherein the dough is kneeded, flipped, stretched, laid thinly and finally folded into a square or slightly round. It is then cooked on an iron skillet till brown. It is usually served with dhall or curry (chicken or fish). I like mine with curry and I usually start off by laying curry on the plate, followed by the Roti Canai and topped with another layer of curry. Roti Canai is available in Malaysia and Singapore. I have not travelled to other countries in Asia …so I am not in a position to comment on their availability elsewhere. Enterprising and creative cooks have come out with variants of the Roti Canai and have put in various types of fillings such as egg, sardine in ketchup, bananas, cheese, onions and kaya. No Roti Canai will be complete without the Teh Tarik (or “pulled tea”). For more information on Roti Canai, check out the Wikipedia. 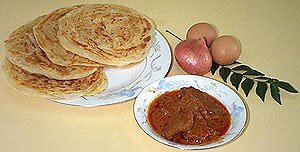 I now leave you with a Roti Canai recipe which I sourced from http://www.seberangflour.com.my. Dissolve sugar and salt in water. Add milk, egg and flour and blend well. Add the margarine. Knead the dough until smooth and no longer sticky. Divide dough into 70 gms pieces. Shape the dough into balls and coat with margarine. Cover the dough and leave for about five hours or overnight. Gently press the dough with palm, stretching it slightly. Hold the dough and stretch to expand the dough piece. Repeat this step for about eight times. Finally you should get a piece of thin sheet of dough. Fold up or coil into a lump. Leave the dough for ten minutes. Fry on both sides over medium heat until golden brown. Serve Roti Canai with Curry.